For some time, the Kingdom of Saudi Arabia, home to the second-largest oil reserves in the world, has taken steps to diversify into renewable energy generation. In solrico’s international survey, conducted among suppliers of solar water heater kits in late 2018, it was ranked the world’s fifth most promising export market in the years to come. Residential buildings, followed by solar-heated pools and hotels, drive demand for hot water in the country. The photo shows a commercial client: the five-star hotel Crowne Plaza Jeddah Al Salam in the city of Jeddah ordered a 208 m² flat plate collector system from Greek-based Sole. Despite the potential, Saudi Arabia’s new energy efficiency policy had created some import barriers that would need to be eliminated if the market was to grow, explained Miriam Martinez, Export Coordinator at Sole. Monica D’Appuzo, Product Manager at the Ariston Thermo Group, based in Italy, agreed, saying that the launch of Ariston’s new products had been delayed in order to carry out a more specific market study and fulfil certification requirements. At present, domestic appliances have to satisfy the standards set out in the national Energy Efficiency Labeling (EER) programme, which includes quality inspections in factories. EER labels are issued by the Saudi Standards, Metrology and Quality Organisation (SASO) and are valid for one year. They must be affixed to the product, where they offer a simple, clear description of performance, energy efficiency, and other information needed before purchasing, with the number of stars indicating how efficient a device is. 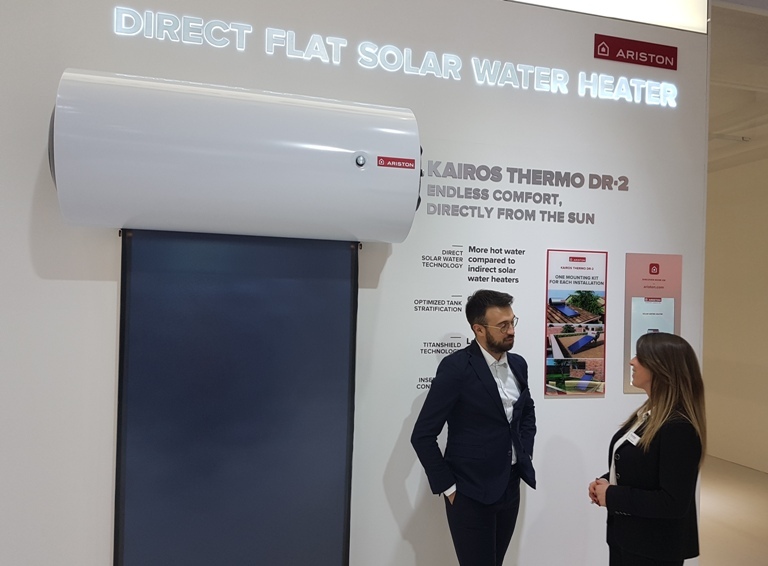 Ariston has just launched its new line of direct solar water heaters designed for high temperature climates and found a market for them in countries across the Asia-Pacific region. It intends the line to be available in Saudi Arabia and UAE within the next months. Two system types are offered, namely an Electrosolar system, equipped with a 2 kW backup heating element, and the Standard unit, which has no electric backup heating. Both will be sold with either one collector and one storage tank, to hold 100, 150 or 200 litres, or two collectors and a 250-litre tank. This article was written by Lotus Shaheen, a German-based clean energy researcher with expertise in solar thermal quality certification and MENA markets.